South Africa will take nationally appropriate mitigation action to enable a 34% deviation below “Business As Usual” emissions growth trajectory by 2020 and a 42% deviation below “Business As Usual” emissions growth trajectory by 2025. In accordance with Article 4.7 of the Convention, the extent to which this action will be implemented depends on the provision of financial resources, the transfer of technology and capacity building support by developed countries. The prioritization of mitigation interventions that significantly contribute to a peak, plateau and decline emission trajectory where greenhouse gas emissions peak in 2020 to 2025 at 34% and 42% respectively below a business as usual baseline, plateau to 2035 and begin declining in absolute terms from 2036 onwards, in particular, interventions within the energy, transport and industrial sectors. The second piece of text gives some insight into the South African view of “business as usual” which is otherwise missing from the Green Paper. According to the IEA, energy emissions in South Africa were 431 million tonnes in 2008, which represents a growth of about 2.5% p.a. from 1990 or 3% p.a. from 1971. Continuing at 2.5% p.a. 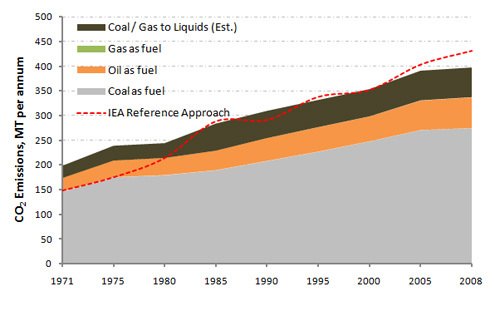 until 2020 gives energy emissions of 580 million tonnes. A 34% reduction below this gives a 2020 target of 383 million tonnes, well below a peak. 3% growth from 2008 with a 34% reduction still represents an absolute fall in emissions, with emissions growth needing to be over 3.5% p.a. before a 34% reduction represents a plateau at current levels. Such a growth rate does not appear to be consistent with historical trends, although with strong commodity prices in operation globally driving a mining boom and SASOL expanding its coal-to-liquids operation there may be some step changes in the pipeline. If we assume that the absolute emissions goal for South Africa for 2020 is equivalent to current levels, the scale of the challenge facing that economy becomes clear. The South African energy mix is nearly 85% coal, with the balance being crude oil derived products (vs. coal / gas derived oil products) for transport. There is currently no natural gas of consequence in the energy mix, with minimal local production, no LNG terminals and one import pipeline from Mozambique which directs gas to SASOL a gas-to-liquids plant. With growth almost certain in transport but no effective biofuel industry and residential emissions (from coal) growing at twice the rate of other sectors, reductions will have to come from the power generation sector or the SASOL coal to liquid plants. Although there is an active renewable energy industry and 5% of electricity is delivered by two nuclear power plants, expansion in these areas will not create reductions until less coal is consumed for electricty production. Gas may also figure in the mix one day, but as noted that is not there today. That means efficiency gains in the power stations are the only immediate option as plant shutdowns seem unlikely given the tight electricity supply-demand situation in the economy. If efficiency cannot be substantially improved that leaves the SASOL plants. Two major coal-to-liquids plants and a smaller gas-to-liquids plant emit some 60 million tonnes CO2 per annum, much of it as a nearly pure stream as a result of the chemistry of the conversion of coal to syngas followed by a Fischer-Tropsch reaction. Only one solution exists here, carbon capture and storage. A major project would not only demonstrate the immense potential of CCS and the scale to which single projects must aspire, but could balance the books in terms of the national target as renewable energy projects and energy efficiency measures limit the emissions growth in other sectors. But such a project will require considerable financing and a carbon price. Although COP 16 in Cancun saw a major step forward in terms of CCS eligibility within the Clean Development Mechanism, the state of the global offset market does not lead to the view that it could offer much support to a 10-20 million tonne per annum sequestration project starting up around 2020. Both the mechanism itself is struggling and the demand for credits is weak with only modest buying through the EU-ETS. South Africa’s ambitions deserve praise, but the question now will be the ability of developed countries to help them deliver or do we all just wait for the government to call on its reduction caveat, i.e. “the extent to which this action will be implemented depends on the provision of financial resources, the transfer of technology and capacity building support by developed countries”.